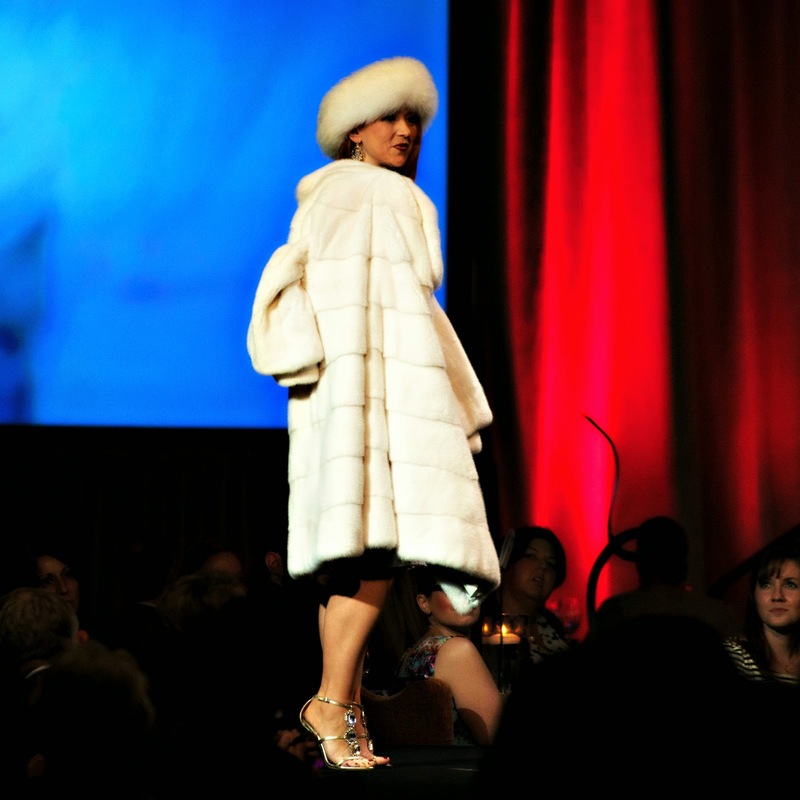 At the afterparty for the Dress for Success Indianapolis fundraiser "Stepping Out In Style" a few weeks ago, one of the guests described the head to toe winter white look I sported for my final turn on the runway as "Bond Girl Chic." I am certain that I glowed at the compliment (and also immediately thought, "that's a good title for a blog post)." Indeed, I did feel very chic in white mink from Elan, crystal-encrusted Badgley Mischka heels, and an intricately crocheted and couture-constructed Byron Lars Beauty Mark dress from Enza's Boutique. There's something about winter white that always makes me feel elegant (that is, until in my infinite gracefulness I inevitably spill something on it). Others must surely feel the same, as the buyer for Enza's reported that SOIS guests flocked to the store and snatched up every one of these dresses within days of the event. Wear it well, ladies! Bond Girl Chic. What fun! That might be one of the coolest compliments I've ever received on an outfit. But, as I sat down to write this post and contemplated further, I started to think about Bond Girls and how they've been portrayed through the years. As much as I love my 007 movies, I have to admit that, especially in the early years of the franchise, the women were often no more than damaged, weak, objectified supporting characters who were powerless to resist a sexist leading man. Thankfully, more recent installments of the iconic series have featured stronger, sharp-witted female characters with identifiable skills beyond traditional "feminine wiles." From Halle Berry in Die Another Day (also the name of a great Bond-Inspired OPI nail polish color, by the way), to Naomie Harris in SkyFall and, of course, Dame Judi Dench as Bond's MI6 supervisor, M, Ian Fleming's original damsel in distress stereotype seems to be fading with the changing times. I'm thankful for this. Not all of the critics agree on the progress, though, and there are a number of articles that have been written on the topic (this one and this one, for example). Next week, I'll have the pleasure of attending a dinner for the Women's Fund of Central Indiana (an organization that has provided critical support to Dress for Success Indianapolis and myriad other women and girl serving organizations in Central Indiana). The dinner features Academy Award Winner Geena Davis as the keynote speaker. Geena has made a life long mission of bringing gender equality into the popular culture lexicon and to working within the entertainment industry to alter stereotypical reflections of girls and women in television and film. I'd love to hear her take on "Bond girl chic," and I'm certain her speech will give me further reason to ponder the issue. For now, though, I'm going to bask in the glow of what I can only construe as a genuine and well-meant compliment on a great outfit! As one of the most popular and well recognized staple characters of the James Bond movies, the Bond Girl is both a cultural icon and phenomenon.